If you remove header/footer from a page of a Word doc, header/footer from the entire document disappears. Similarly, if you insert header/footer to a page, the same is copied to entire pages of the document. This is how header/footer supposed to work. Now, if you need to apply unique header & footer to a page or part of a document other than the rest of the document, how will you do that? The trick lies in separating the pages which would have unique header/footer from the rest of the document using Section Breaks. The separated sections can be applied with unique formatting and styling. For example, suppose the pages 5 to 7 in your document to have a unique header/footer than the rest of the document. From the Word Ribbon, click the tab Page Layout and then click Breaks under the group Page Setup. From the drop-down list, click Next Page under Section Break. See below screen. Now on the 5th page, enable the header/footer sections by double clicking the top/bottom of the page respectively. The Header & Footer Tools tab is enabled on the Word Ribbon. From the Header & Footer Tools tab, under the group Navigation, click the Link to Previous icon to de-link the current section from the previous section. This is the key step of the procedure. Now, enter new header/footer content on the 5th page. Similarly, enable the header/footer section on the 7th page and click the Link to Previous icon to disable the linking between current and previous sections. On this header/footer, you can repeat the header/footer of the first section. Posted on April 4, 2013 by wordknowhow •	This entry was posted in Uncategorized and tagged delete header and footer, remove header and footer from one page, remove header and footer from the first page, remove header from the current page, removing footer from section of word document. Bookmark the permalink. Thank you!! That helped me very much! Thanks! Tried to figure it out on my own for about an hour. Is there a way to start and stop a header in a document? did you mean adding and removing a header? Hithank you. This is very useful. Please check the post “How to fix multilevel list in word”. Hope this will help! If not, please let me know. This really didn’t help me at all because when I go to page two and double click in the header “link to previous is grayed out and I cannot delink it. In my file there is already a section break inserted in the letterhead. Even if I add another one and make sure that I’m in the next section – it’s grayed out. Same is true if I start over with a new document. The only way I can get this to let me have a second page with no header is to stop typing before I hit the end of the page and resume at the top of page two without actually trying to just type and let it automatically roll over into page two. This simply doesn’t make any sense to me. If you don’t mind and have some idea please respond to my email address below. This is driving me bonkers. Dorothy, it is very difficult to visualize the document you are working on. Can you please make sure that you are using a “section break”. Logic is, if the section break is on 2nd page, then from the third page header, click the “Link to Previous” icon. This way you can have separate header/footer in first two pages and then for rest of the pages in the document. have you any info about it ?????? Hey, glad that it helped you…No, I said ‘Link to Previous’ needs to be disabled to de-link header/footer. By default, ‘Link to Previous’ is enabled. After de-linking, header/footer got separated and unique header/footer can be used. have u more info about this problem????? 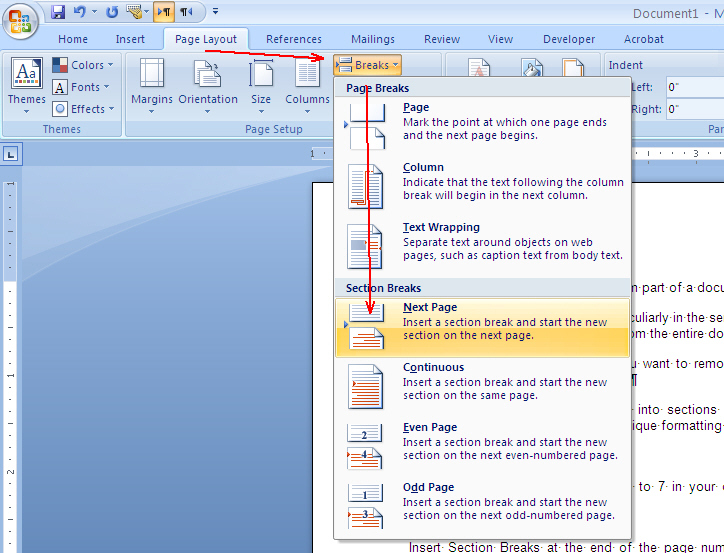 Hi Fanty, are your sure that you have created sections in the document using Section Breaks (i.e. Page Layout >> Breaks >> Next Page)? Suppose, you applied section break on page number 3. Open the header/footer in the Edit mode on page number 4 (by right-clicking on Header section, and then click ‘Edit Header’). You can view the “Link to Previous” icon as enabled. Click this icon to disable. This separates the header/footer of page 4 from page 3. Thus, header from page number 4 can be deleted without deleting the header of page number 1 to 3. Now, insert a new header on the page no. 4. I hope this helps. could u have more suggestions??? ?